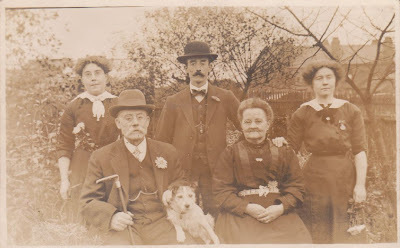 This group of people with a little dog have mostly faded to a sepia tinge, apart from that is the head of the man centre back, and the tree branches behind him, which for some reason did not get so exposed to the light. The picture has a floral theme. The men have flowers in lapels, two ladies have flowers in belts, and the other lady holds some flowers.